Rancocas Valley’s Darnell St. Clair, here going for a layup against Highland on Dec. 22, scored 10 points as visiting Rancocas Valley edged Bordentown on Wednesday. D'Andre Thurmond scored 18 points Thursday to lead the Burlington City boys' basketball team to a 74-52 win against host Westampton Tech in Burlington County League action. Amir Landrum and Jeremy Young each scored 17 points in the win. Manny Jeh was the top scorer for Westampton Tech in the loss. 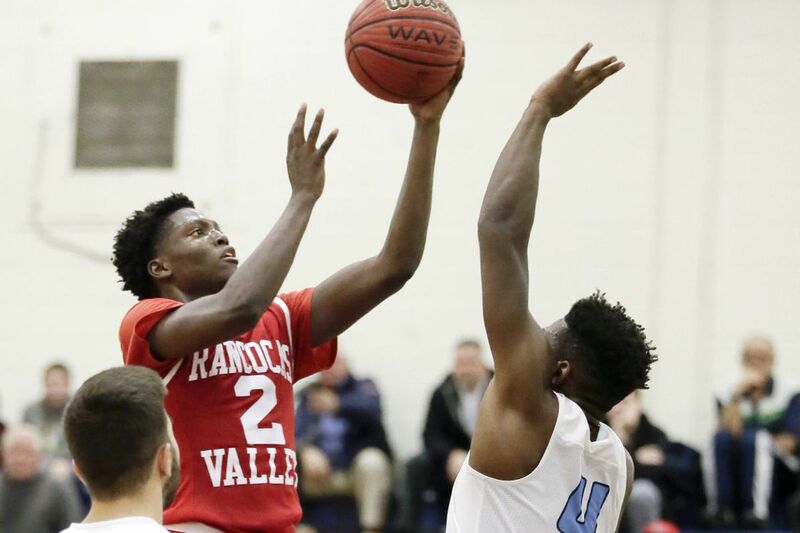 Darnell St. Clair scored 10 points as visiting Rancocas Valley edged Bordentown, 42-40, in Burlington County League play. Tom Zanaras tallied 19 points to lift Mainland past Cedar Creek, 57-39, at home in Cape-Atlantic League action. Duncan Scandin scored 11 points and Gabe Fooks-Michnya chipped in 10. Jay White led Pennsauken Tech with 26 points in a 56-38 victory against Camden County Tech at the Wells Fargo Center. Bella Runyan scored 23 points as Moorestown Friends fell on the road, 68-40 against Pennington. Senior Charlotte Stern scored 13 points to move into second on the school's all-time scoring list with 1,105 points. Jessica McNeil is the all-time scoring leader with 2,073 points. Zaria Spence scored 15 points, Gabby Senni added 14 and Jaylyn James chipped in 12 to lead Burlington Township past visiting Maple Shade, 53-31. Taylor Martin poured in 21 for Maple Shade in the loss. Ocean City got 16 points Emma Finnegan and 15 points from Danielle Donoghue as the Red Raiders rolled past Absegami, 64-28, at home. Ernsvitha St. Juste led Doane Academy to a 46-23 win against host Villa Victoria in Penn-Jersey League action. St. Juste picked up 10 rebounds, 3 assists and 3 blocks on the afternoon.